Is The 2012 Great Derivatives Fire Like 1666? 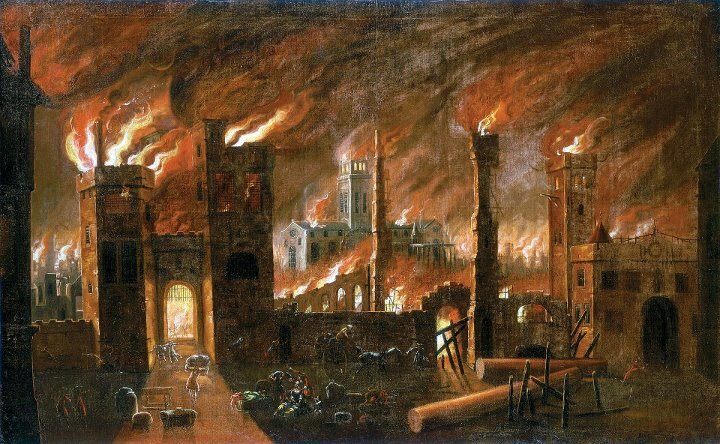 In 1666, The Great Fire of London caused massive systemic damage. Outdated complex building structures made of combustible material were huddled together and caught fire one after the other at rapid speed. Why did this happen nearly 350 years ago? The wood-and-straw structures were haphazard implementations of unethical building practices that paid little heed to risk management and were allowed by the oversight of regulation. Is the “Great Derivatives Fire” engulfing JPMorgan et al now similarly out of control and in resonance with 1666? Losses from trading bets made by "London Whale" at JPMorgan have risen from $2bn to $3bn in just four working days and they continue to rise much faster than originally anticipated. Have Too Big To Fail (TBTF) financial institutions become Too Big To Manage (TBTM) or simply Too Big (TB)? As other TB financial institutions eventually get roped into interlinked losses via complex derivatives' entanglements -- tracking different asset classes -- is the $1.4 quadrillion derivatives pyramid about to catch fire a la 1666 and come tumbling down along with all the Too Bigs or TBs? Please join the Socratic dialogue on ATCA 5000 at https://www.yammer.com/atca. We look forward to hearing from you!